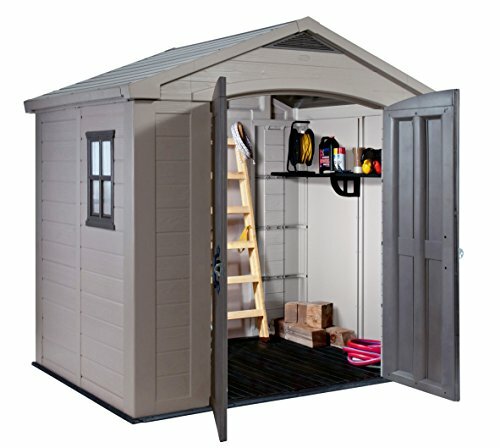 Updated January 2019 - After further research, our new 'Best Pick' is the 'Keter Factor shed', whether your in need of a small shed to store your cordless lawnmower and a few garden tools or larger substantial shed to store your ride on lawnmower, rotorvator and your endless selection of garden tools, the Factor shed is available in a range of sizes to suit your own personal needs. We have also added a metal shed alternative which is made from steel which is a good alternative worth considering as it has the same quality as a plastic shed in terms of low maintenance but with the added security of being made from quality sheet metal. Garden sheds are one of the most expensive garden products most home owners will ever buy, so it’s important to choose a shed that is right for you and meets your needs. There are many types, with the three main ones being wood, metal and plastic. With some wooden sheds being easy to break into not to mention high maintenance as they need treating with a new coat of paint, ideally every year. Metal sheds are strong but can be difficult to built with hundreds of tiny screws and damp condensation can cause problems with items stored in them. Because of these potential problems lots of people are now turning to plastic sheds for there extra storage space. This goes to the Outbox Garden Storage Shed. At 6 x 3ft, the shed offers a decent amount of space for keeping your belongings. Its 2 doors will allow most large sized garden equipment to go in and out of the shed without any challenge. What stands out with this model is the security features and quality. With a 5 point locking system combined with pick and drill resistant locks, you can rest assured that you’ll get out every morning and find your valuable items in there. The steel material itself is very strong, rust-resistant and weatherproof. The surface is easy to clean and that’s something you’ll do as part of maintaining the shed. This one is also warranted for 10 years, however, make sure you care for it enough to stand the warranty. If your after a metal shed and security is top of your list then no other shed even comes close, it may be a little more expensive but its worth every penny and don't forget its available in many sizes not just the size we reviewed it in. What makes plastic sheds appealing to many people is they are literally maintenance free as they require no painting and some manufactures are even giving 10 year guarantees with there sheds. Most are easy to assemble, made from strong polypropylene resin which is robust, yet flexible and fade resistant keeping it looking good for many years. 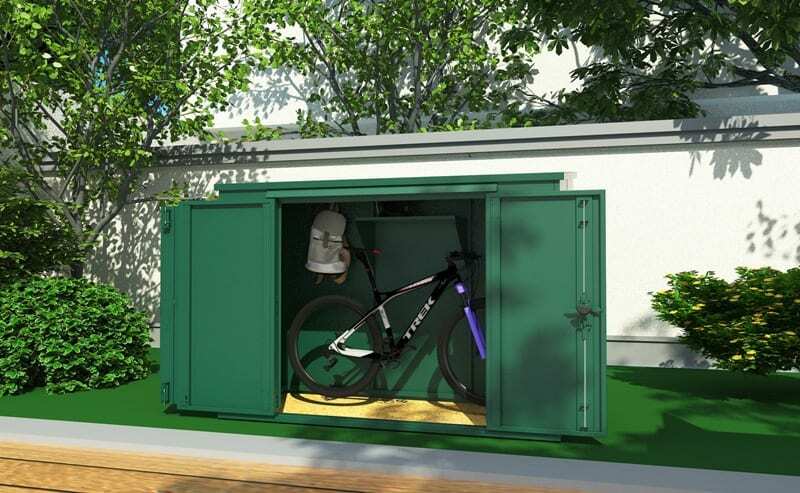 Most are lockable to keep your items safe and they come in a range of sizes and styles to meet everyone’s needs. 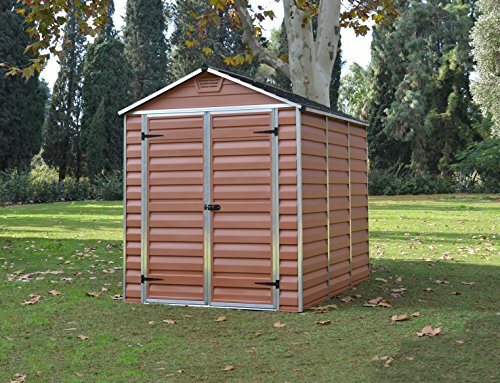 There are many plastic sheds available from garden centres and online stores including some low quality substandard models from china which are usually cheap copies of quality branded models from companies such as Keter, Duramax and Palram. 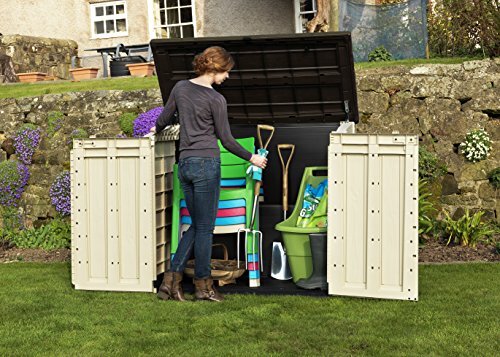 If the 6ft x 4ft Keter Factor shed was not quite big enough for you, then this 8ft x 6ft model which gives you that little more extra room for storing more items such as bikes, paddling pool, cordless garden blower, pretty much anything you need to store in the garden. It is built from the same quality materials you expect from a Keter shed, has a steel rein-enforced structure and strong hard robust floor, as well as them all important, roof skylight and side window, which allows more light into the shed. As you can see from the picture, It has two opening doors, making storing large items easy, it even comes complete with two shelves for easy storage of tools. Keter is one of the best and most trusted manufactures of plastic sheds in the world, made from strong polypropylene resin plastic, which makes it fade resistant as well as very strong. They make many models in various sizes but this ‘Keter Store It Out Max’ is the number one best seller on Amazon with over 900 near perfect reviews from hundreds of satisfied Amazon customers. 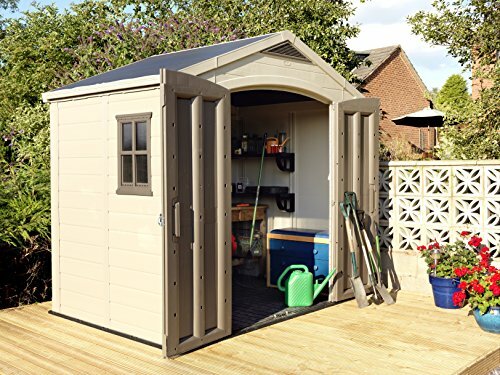 It's more of an extra large storage cupboard that a traditional shed, however as it meets the needs of most gardeners, and the fact we also have one in our garden, it's made it onto our list. It has a large 1200 litre capacity, ideal for storing most garden items from lawn mowers, garden tools, chairs and anything else you can think of, that needs to be stored in your shed. To give you a better idea of the size, it will store two large 240 litre wheelie bins. Features include, two front opening doors, and a piston operated lifting lid, for easy access with a lockable bolt and padlock facility for extra security. If you have every been to a caravan park, you may have noticed this mode, is extremely popular as they provide some extra storage. Its 125cm tall, with a width of 145.5cm and a depth of 82cm. If your looking for a garden shed, just that little larger, with a little more head height, then this may be for you. At 216.5cm tall, it's ideal for storing taller tools that might not fit into the smaller storage unit we looked at above. This traditional apex designed shed is made from durable polypropylene resin, that is also 'uv stabilised', which basically means it will not fade, which is a common problem with some cheaper brands. It has a steel-reinforced frame for extra strength and has a skylight and side window, which lets in plenty of light, a feature, most sheds simply do not have. It comes with a strong hard wearing floor and can be locked with a padlock for security. It comes with a 10 year manufactures limited warranty for peace of mind. Dimensions: 216.5cm tall x 129.5cm wide x 195.5cm depth. When it comes to plastic sheds, Palram really do make some of the best models available, and they also have some unique features you often don’t get on other plastic sheds. So what makes it the the ideal candidate for our best sheds review, firstly it made from strong polycarbonate panels which are, virtually unbreakable, and for added strength, it has a aluminium and galvanised steel frame. Notice there are no windows on this model, this will reduce the risk of people braking in through the side windows as there are none, our first thoughts, this is going to be dark inside which is a big negative. Well the smart designers at Palram have thought of this and have fitted it with a tinted light transmitting roof. This clever design, let's plenty of light into the shed, so you will have no problem finding your tools. It does all this without compromising on strength and security. Finally, it has a non slip floor and ram, this is great as you can push a wheel barrow and the lawnmower into the shed with ease, with no awkward lifting to get it through the door. Finally, as you would expect, it can be locked with a padlock for security. 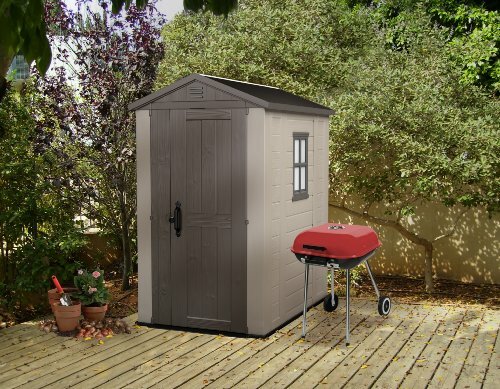 If you have got plenty of space in your garden, then this Duramax garden shed is ideal for those needing lots of room to store their large collection of garden tools, it boast an impressive 481 cubic feet of storage room. It has a reinforce steel structure which enable you to fit shelving or hang garden tools from it, without putting strain on the shred structure which can buckle cheaper models. Made from quality, durable but very strong vinyl panels, it has two large opening doors with lockable handles for security and a fixed window. 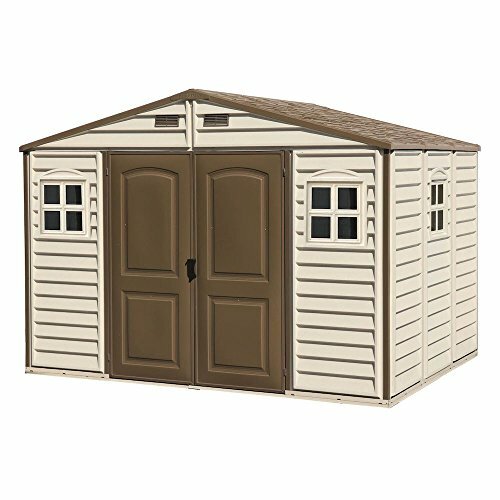 The only downside of this shed it does not come with a shed base, ideally it would need to be fixed to a concrete base or another suitable solid floor such as flags or a raised wooden floor. You can also sit a plywood floor onto of the base. Both Keter and Palram manufacture the best plastic sheds available with Keter having the largest range of sizes. The Skylight and window on the Keter range are a good feature but could give unwanted access to criminals all though the windows are very strong and we have read no negative reviews about this being a problem and on Amazon there are literally hundreds of reviews. We like the way Palram get around this by using a roof that lets light in, overall sheds by Keter and Palram are very well built sheds with at least 10 years manufactures warranty and despite being made from plastic they will look at home in most gardens. We look at the best pillar drill and find 6 amazing models with a budget to suit everyone.